The Hydra-Sports 4200 SF is a practical motor boat fitted with a wide range of features that were especially designed to make your life on board as enjoyable as it can be. Among them you’ll find an air conditioned cabin that features 6’ 6” of head room, a china marine head with a 16 gallon holding tank and overboard discharge, microwave, fresh water sink and two showers. Moreover, the boat can accommodate up to 15 people, features 7 fish boxes and ca hold up to 800 gallons of fuel. At the heart of the Hydra-Sports 4200 SF sits a lively engine that can propel it to a maximum speed of 67 mph with a cruising speed of 46 mph. With a full tank the boat can run up to 493 miles which is pretty impressive. Hit the jump for more information on the Hydra-Sports 4300 SF. As the name suggests, this new model is equipped with an air conditioned cabin that features 6’ 6” of head room and a perfectly comfortable resting spot for those big days at sea, a china marine head with a 16 gallon holding tank and overboard discharge, microwave, fresh water sink and shower, and tons of dry storage. The cabin is illuminated with sky lights and LED lamps. 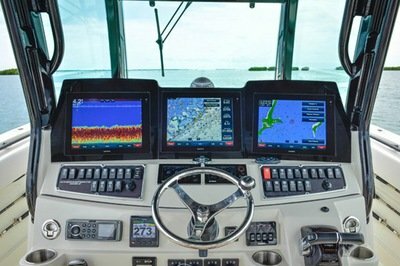 Every once in a while something comes along that makes people look at boats differently…Hydra-Sports 42 is one of them. 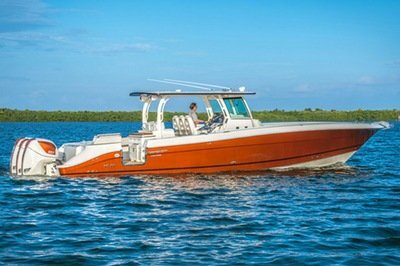 he’s the only 42 rated for 4 v-8s for sustained high speed offshore operation in total seating comfort and a rock your world stereo. 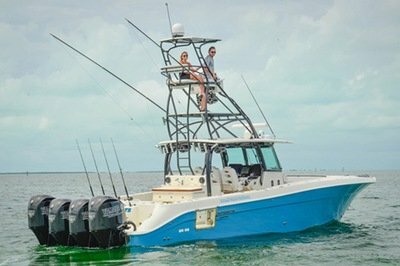 Experience the HydraSports Custom today and see fishing and cruising in total comfort really makes a huge difference. DRAFT – ENGINES UP 24"